A fine example of street-level 1970s filmmaking, Straight Time presents a downcast story of a man looking for a break but unable to escape his past. Dustin Hoffman delivers a gritty performance as an ex-con briefly tasting freedom but finding the lawful life most unwelcoming. Max Dembo (Hoffman) is released from prison after serving a six year sentence for armed robbery. He makes a seemingly genuine attempt to earn an honest living despite the bullying presence of his parole officer Earl Frank (M. Emmet Walsh). Max meets Jenny (Theresa Russell) at an employment office, and they start a tentative relationship as he secures a grimy apartment and an unglamorous job at a canning factory. But an unfortunate encounter with Willy (Gary Busey), a former colleague from his criminal days, derails all of Max's effort to go straight, and lands him on the wrong side of Earl's intentions. Max snaps, humiliates Earl by chaining him to a fence on a freeway median, and slips back into a life of crime. With Jerry Schue (Harry Dean Stanton) as a partner, he embarks on a crime wave that soon turns bloody. The ease with which Max get back to grips with a life of hold-ups, guns, greed, shady characters and murder betrays his earlier attempts to reintegrate into society. Earl's boorishness was just the first in what would have been many obstacles for Max to overcome to go straight, and his tendency for violence and comfort with brutality are clear indicators that he never really stood a chance. 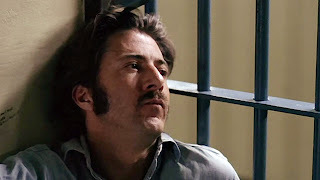 It is to Hoffman's credit that for the first part of the film, we believe that his struggle for civility is well intentioned, and this makes his about-face and headlong dive back into violence a memorably jarring transition. M. Emmet Walsh is deliciously hateable, a man whose instinctive mistrust of ex-cons proves to be both well-placed and a self-perpetuating stance. Gary Busey nails Willy as a dim-witted, jovial bear of a man, a victim since the day nature handed out intelligence. Smarter but no less ill-fated is Harry Dean Stanton's Jerry, a reluctant rifle man, unable to resist the buzz of the hold-up but equally unable to control Max's excesses. Kathy Bates appears in a small but memorable role as Willy's wife. Theresa Russell's Jenny is fresh-faced and innocent, a 1960's left-over deep into the desperate 1970's. Her character is the only odd fit in the movie, Jenny's desperation to fall for and then stay with a man having a shadowy past and no future prospects left unexplained. Director Ulu Grosbard finds the more dank corners of Los Angeles to place Max's story, easily overcoming the absence of New York by further degrading Max in the city of supposed dreams and opportunity. 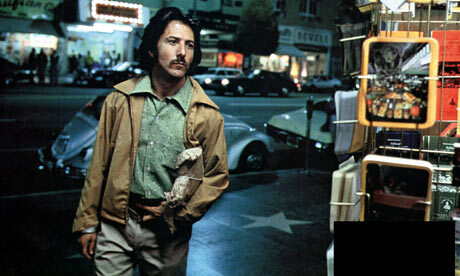 Grosbard keeps Max at the centre of the story and the enigmatic Hoffman in the middle of the frame, with no chance to escape to the edges of his natural tendencies. Straight Time is a story of lost hope and preordained destiny. There may be a willingness to change the course of a life, but sometimes the gravitational pull of history determines the future.